The playground is a perfect theme for making language skills functional! 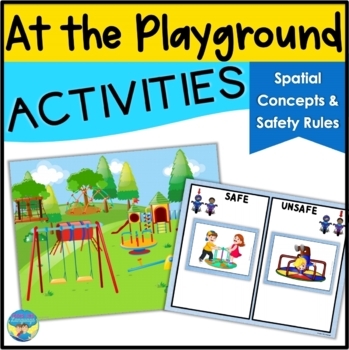 This multiple activity set will keep your students engaged as you build skills for playground vocabulary, rules. and actions, spatial concepts, answering where, following directions, sorting by categories, and expanding sentences. 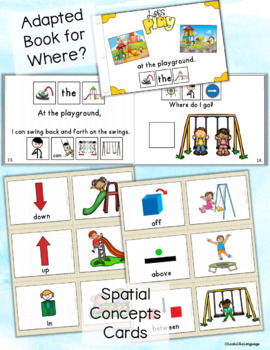 1- Reading the playground adapted book and answering 'where' using spatial concepts. 2- Using the interactive playground rules book to teach social rules for interacting with others on the playground. 3- Play the spatial concepts playground matching game receptively or to use prepositions in oral sentences. 4- Work on following directions or describing with the 2 playground scenes and 25 children, or use as a barrier game. Save $$ with the Spring Activities Bundle! * a 20 page interactive playground book with symbol supports. * a sliding board safety book- great for discussing cause- effect. 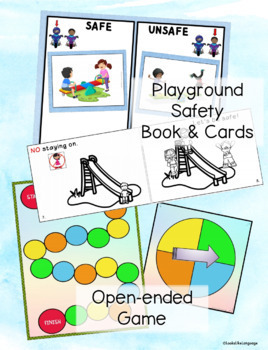 * 9 playground themed worksheets for varied skills and levels. * 36 game cards for using spatial concepts and playground vocabulary in sentences. 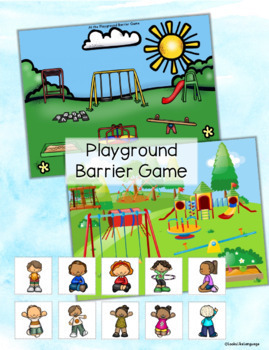 * 2 playground barrier game boards for listening skills, using spatial concepts and describing.